Let’s get this out of the way quickly: the Miami final between Andy Murray and David Ferrer was not a very good tennis match. It was a tense affair, and both men struggled to cope with the situation, their opponent, the noon Miami sun, and who knows what else. Of the 208 points played, 45% ended on an unforced error. And sadly, much of the good things that were going on during the match were obscured by the patchy level of play. However, I did want to capture Andy Murray’s Forehand and Backhand Efficiency Ratings during this match, since I was very curious about what his numbers would look like in a final like this. I also wanted to see what kind of numbers I’d get from a member of the Big Four against a quality opponent. A reminder: I count only groundstrokes, which don’t include first serve returns or overheads. Tweeners are out, too. I made a tweak in my methodology for this match. In previous posts I’ve counted the forehands and backhands myself, and then used the unforced error count from the TennisTV stats. However, today’s match was unavailable on TennisTV here in the United States, since CBS owns the rights to it (more on that debacle tomorrow). Hence, I counted forehand and unforced errors myself, with the added benefit of now having a game-by-game breakdown of those numbers, instead of a lump sum at the end of each set. 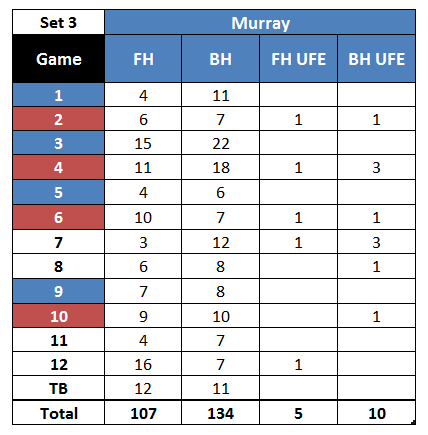 As always, the red highlight on games 2, 4 and 8 mean that Murray’s serve was broken, while the blue highlight on game 7 means that Murray broke Ferrer’s serve in that game. – Andy Murray threw in three double-faults in this set. – Even though the Scot served 60% first serves, he only won 50% of the points played with it, and an atrocious 25% of points played with his second serve. – Nine of his 14 groundstroke unforced errors (not counting double-faults) came during Andy Murray’s service games. – Ten of the 14 unforced errors came in the first four games of the match. That’s pretty high. As you can see, Murray had started to improve his efficiency after that, ceding no unforced errors in the fifth game. However, Judy’s son did play an atrocious eighth game, in which he surrendered his serve at love after committing two double faults and two forehand unforced errors. – It’s fascinating to see that Murray’s backhand donated all seven of its first set unforced errors in the opening four games of the match. – It’s interesting to see that Murray hit 12 more backhands than forehands in the set. This was heavily influenced by David Ferrer’s gameplan: the man from Javea wanted to push Murray wide on his backhand corner, creating good opportunities for a dangerous inside-in forehand on Murray’s very empty deuce court. The numbers make sense. So far, this is the first time in four tries that I’ve seen someone have an Efficiency Rating of under 90% on their stronger side. Maria Sharapova never went beneath a 93% Rating on her backhand against Sara Errani, Serena Williams’ low was 92% on her two-hander during the semifinal against Radwanska. During his match against Kei Nishikori, David Ferrer’s forehand didn’t go below a 94% Efficiency Rating during either set. What is not uncommon is to have an Efficiency Rating around the mid-80s for someone’s weaker wing. Sharapova’s forehand only got up to an 87% Rating in that Errani match, and Serena’s forehand got as high as 86% (and that was during a 6-0 set) against Radwanska. The exception is David Ferrer, whose backhand had an insane 98% Efficiency Rate during the second set of his match against Nishikori. Regardless, we can see that Murray’s numbers didn’t look very good, and if you watched that first set, the eye test said the same thing. The newly-minted World No. 2 served poorly and was way too erratic. Of course, it didn’t help matters that Ferrer made few mistakes and played at a high level for most of that set. – Notice how Murray committed 10 of his 14 unforced errors of that first set during his service games (if you add the three double faults, you can say that Murray donated 76% of his total unforced errors of the first set on his own service games. A very bad thing to do). – Also note that Murray had to hit 34 groundstrokes during his four return games, but he had to hit 70 during his four service games. – Murray’s first serve percentage actually went down to 48%, but he was way more effective with his first serve, winning 73% of points played with that delivery. The percentage of points won with Murray’s second serve also went up to 56%. The double faults kept popping up: there were 2 more in this set. 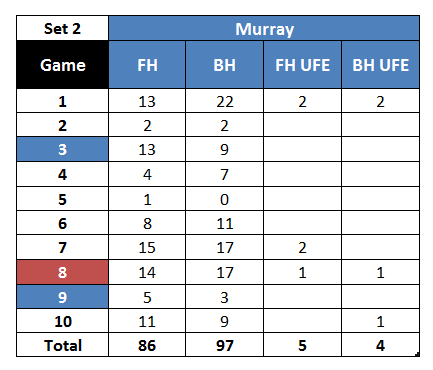 – Notice how Murray didn’t commit a single groundstroke unforced error during games 2 through 6. That’s five spotless games. – Murray hit 11 more backhands than forehands. – Murray went from committing 14 groundstroke unforced errors in the first set to just nine in the second set, even though two more games were played. That’s a 9% improvement on the Forehand Efficiency Rating, and an 8% improvement in the Backhand Efficiency Rating, all the while hitting a much higher volume of shots (almost 80 more than set number one). Remarkable. – It’s fascinating to see that two-thirds of Murray’s unforced errors in the second set came during his return games. – Note how Murray committed zero unforced errors in the two return games in which he broke serve. Make a mental note of this, you’ll see why later. – The man from Dunblane improved his first serve percentage from 48% in the second set to 55% in the third. However, his efficiency with both his first and second serve went down, for some reason. The percent of points won with his first serve went from 73% in the middle set to 62% in the third set, and the points won on Murray’s second serve went from 56% to a measly 31%. Murray added no aces, but did throw in two more double faults. At this point it should be made clear that even though Andy Murray didn’t have a particularly good serving day (that’s an understatement), he was also playing one of the world’s elite returners of serve today. This little fact tends to pull serving numbers down. – Notice the incredibly high volume of groundstrokes (a total of 241). 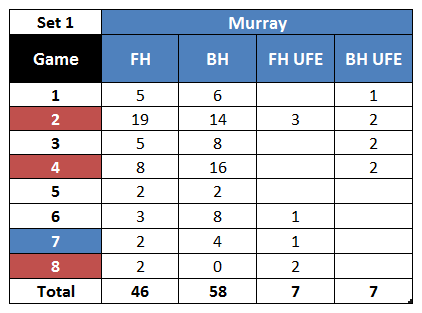 And notice that Murray hit 27 more backhands than forehands in the entire set. – Yes, Murray had 15 unforced errors. But look at how they’re distributed: the man known for having a bad forehand committed just five forehand unforced errors in a tough, long and nervy set that ended up in a tiebreaker. – Do notice that Murray committed just three unforced errors after the seventh game. In crunch time, Murray found ways to clean up his game – even though he did get broken when trying to serve it out, and Ferrer came within inches of winning the title in the 12th game when a Murray forehand barely caught the line. I can’t get over how great his forehand fared in that set. Think about it: Murray avoided mistakes on 95% of his forehand attempts in a deciding set of a Masters 1000 final, just as the consequences of playing a noon final in Miami started to take a toll on his body (Ferrer ended up cramping later, something I hadn’t seen before). And let’s remember that in that match point that Murray saved, it was a big inside-in forehand that barely caught the line that tempted Ferrer to stop play and challenge the “in” call (not a bad risk by Ferrer, by the way, since Murray had a very simple putaway into the wide open Ad court at that moment. And as we see, Andy wasn’t missing much with that shot). As I always say when I marvel at Murray’s forehand: Ivan Lendl, take a bow! – Isn’t it crazy that Murray committed just four unforced errors during six return games? And they all came in the same game! As we know, Murray is one of the world’s two best returners, and you can see that he had no problems controlling his nerves during those return games. – Notice that Murray had to hit 11 more groundstrokes during his six third set service games than he had to hit throughout all the eight games that comprised the first set. – Andy Murray committed zero unforced errors in the four return games in which he broke serve … as well as in the tiebreaker. That’s pretty astonishing. But, even as we consider that last fact, as well as Murray’s incredible Efficiency Ratings in sets 2 and 3, we need to remember that Andy Murray came within mere inches of losing this title, when Ferrer had a match point on that 6-5 game, and the Scot’s big forehand barely caught the baseline. The thought that keeps popping up in my head during these statistical exercises is how much work someone needs to do in order to win a match. I wrote about the insane efficiency of Serena Williams, who had to hit only 157 groundstrokes to dismantle World No. 4 Agnieszka Radwanska in straight sets. Sure, the Efficiency Ratings are amazing. Truly remarkable, really. But look at the volume of groundstrokes that were needed to win this match: 528. And again, that doesn’t include the 145 serves Murray had to hit (not including lets), or the 55 first serve returns. This just makes you think about how hard tennis players who don’t have a huge weapon have to work in order to have a chance to win. It also tells you a lot about their small margin of error. Yes, Andy Murray had a bad day with his serve. It’ll be interesting to see what his volume of shots looks like in a match where his serve is clicking and he’s getting loads of easy points with it. But against the tennis elite, it’s imperative to find ways to be more efficient during those service games, since everyone at the top is a pretty competent returner. Lendl’s work with Murray’s forehand is surely geared in that direction: getting Murray to be aggressive with his forehand on the first shot after the serve. I wonder what the eight-time Slam champ would think if I told him today Andy Murray hit 12 more backhands than forehands during his 15 service games. Also, there is this: Miami is a slow hard court (the slowest of the Masters 1000s, apparently), and that doesn’t help matters, either. Players with the ability to consistently generate pace (like Serena Williams or Maria Sharapova) can hit through the court. But that’s not the case for either Murray or Ferrer. Especially if you add the fact that both men are among the best defenders in the world. Having said all of that, I can’t help but marvel at Murray’s Efficiency Ratings. 93% off both wings is phenomenal for such a scrappy, nervy match. No wonder the man from Dunblane has made three straight Grand Slam finals and will be the World No. 2 tomorrow. Fernando says interesting analytics – well done. Taking tennis to a new statistical place. To Fernando, this match was about belief- Ferru’s lack of it. Fang was wilting in the 3rd set, demonstrably, and Ferru could not seize the moment. Why? Typically when Ferru gets a whiff that his opponent is fatiguing, Ferru smells blood and amps up his game. He didn’t or couldn’t here. Fernando disagrees with respected Juan Jose on the match point challenge. Ferru stopped the point because of the pressure. A bail out brain freeze fueled by lack of belief. This was Ferru’s greatest opportunity for a true signature win. Ferru is great. But Fernando believes that it is not just physical limitations that prevent Ferru from being elite. There are mental limitations as well. Ferru does not have calm in the truly big moments against the elite. The strange thing is that Ferrer actually played Murray relatively close last year, beating him on clay and taking him to multiple tiebreaker sets on hard and grass, and his losses seemed to stem more from Murray simply being the better player than a lack of belief. Maybe it’s a simple case of repeated losses wearing down even the most stubborn spirit. Whoops – I meant the last two years in regards to Ferrer’s past fights against Murray (as he played Murray on hard courts in 2011 but not 2012). It seems like Ferrer does have more belief in his abilities against Murray, but the latter is also a better match-up for him. Murray doesn’t ruthlessly punish short balls as the other members of the Big 4 do, so that lets Ferrer get closer. Ferrer also seems to have an easier time returning both Murray’s 1st and 2nd serves, for whatever reason. I am quite pleased that the Great Fernando enjoyed this piece! We disagree on the MP challenge, but I do agree with the Wise Fernando con Ferrer’s lack of calm in the big moments against the elite. As an underdog, his margin for error is tiny, so when he does make mistakes against the Big 4, he usually pays dearly for it. 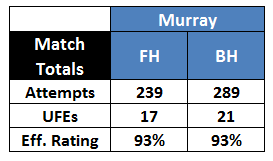 Wow, Murray’s FH/BH efficiencies were a lot better than I thought. Though I’d like to have an idea of the average efficiencies of the typical elite player – the 93% stats are impressive but how would they compare to the stats of, say, Murray’s noticeably better performance in the semifinal? Just how large or small would the margins be between them? That’s a great question, Ophelia. Hopefully in the future I can capture Murray during a straightforward win so we can see what changes and what doesn’t. It wouldn’t surprise me if the numbers are lower, though: in a quick win, you hit fewer shots, so a “good” number of UFEs will bring the Efficiency Number down (as we saw during the Serena-Radwanska match). About Ferrer’s efficiency numbers in this match, we can arrive at an educated number. We know that Ferrer finished with 45 groundstroke unforced errors (25 on the FH side, and 20 on the BH side). My guess is that he probably had a FH Efficiency rating in the high 80s (which would be low for his standards), and a BH Efficiency rating in the low 90s (which would be business as usual for him). One of the things I’d love to explore is Efficiency ratings during losses. Last week I picked the favorites every time, and they all won (only Murray lost a set). And of course, it would be useful to have more than one number for a player!